FEATURES ELEGANT TABLE-TOP DESIGN WITH TANK-IN-TANK CONFIGURATION TO PREVENT OVERFLOW KENT Gold+ has an elegant table-top design, best fit for Indian homes. It can be placed anywhere on a flat surface and comes with a high-base stand enabling easy positioning of glass to draw water. Tank-in-Tank configuration ensures that there is no overflow when water is poured into raw water tank even when the purified water tank is full. 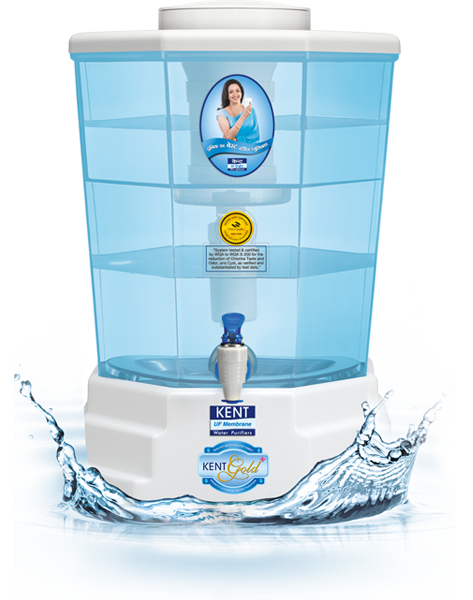 GRAVITY BASED UF WATER PURIFIER KENT Gold+ is first of its kind gravity water purifier which is based on the superior state-of-the-art UF (Ultra Filtration) technology. It removes harmful micro-organisms such as bacteria and cysts, apart from other impurities like dust, sand, chlorine, etc. Infact, it is the only gravity water purifier which is certified to remove cysts. 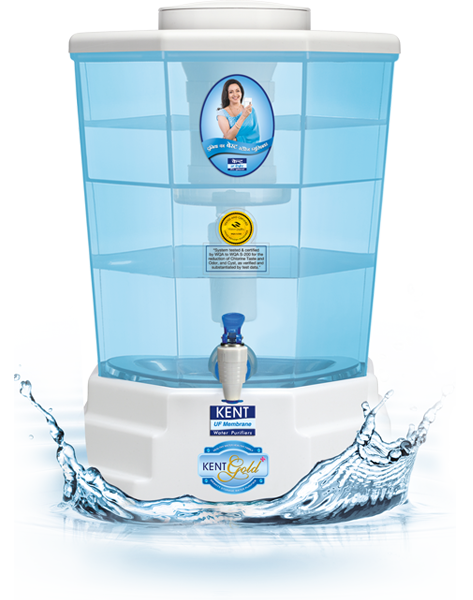 Click here to know more about Mineral ROTM technology NON-ELECTRIC & CHEMICAL FREE PURIFICATION KENT Gold+ works without electricity and does not use any chemicals such as chlorine, bromine or iodine for purification of water, thereby making water safe and healthy for consumption. NSF & WQA GOLD SEAL CERTIFIED KENT Gold+ is tested and certified for its performance and quality by renowned laboratories of the world such as NSF & WQA in USA. NSF and WQA Gold Seal are one of the most recognized certifications in the drinking water treatment industry and provide assurance that the products have been rigorously tested and comply with all the requirements of the testing standards. Infact, KENT is the first and the only company in India to have received certification from NSF. KENT Gold+ is also CE certified. SUITABLE FOR LOW TDS WATER Since KENT Gold+ is based on UF technology that does not remove dissolved impurities, it is suitable for use where inlet water has low TDS (Total Dissolved Solids). WATER STORAGE CAPACITY OF 20 LITRES KENT Gold+ has 10 litres of purified water storage capacity. The storage tank ensures continuous supply of purified water even in the absence of electricity or running tap water. In addition, 10 litres of water can also be stored in raw water tank. INCORPORATES 0.1 MICRONS PORE SIZE HOLLOW FIBER HYDROPHILIC UF MEMBRANE KENT Gold+ has a Hollow Fiber Hydrophilic UF membrane with 0.1 Microns. The pores of UF membrane are so small that they do not allow bacteria or cysts to pass through. SPIN-WELDED UF MEMBRANE HOUSING THAT PREVENTS TAMPERING First of its kind in the industry, UF membrane housing is spin-welded using the latest technology, which ensures high quality permanent joints. Welded housing also prevents tampering and improves membrane life. FOOD GRADE & NON-BREAKABLE PLASTIC CONSTRUCTION Non-breakable feature of the plastic ensures higher durability & longer life of the purifier. Food grade classification ensures that no harmful chemicals leech into purified water.